As one year ends and another one is about to start it is again time to take stock of one’s personal life, the hits and the misses, the highs and the lows. It is also the time to reset and reassess one targets and goals and again bring the mind to a laser sharp focus on the main goals and priorities of 2016. This year will be better than 2015 and this day will be better than yesterday. 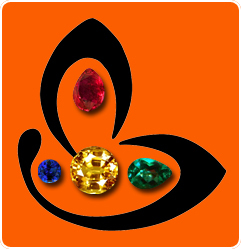 Gemstoneuniverse is pleased to greet all of its viewers and patrons. We all pray and hope that your 2016 will be dazzling, happening and momentous. Keeping this in mind, we decided that the New Year should start with a Jyotish Gemstone Lot of planet that should set the tone for the whole year and with these feelings with offer you The Gemstone of the planet Sun- precious Ruby. It is befitting for, the Sun is the king of Planets. Everything else pales in front of him. 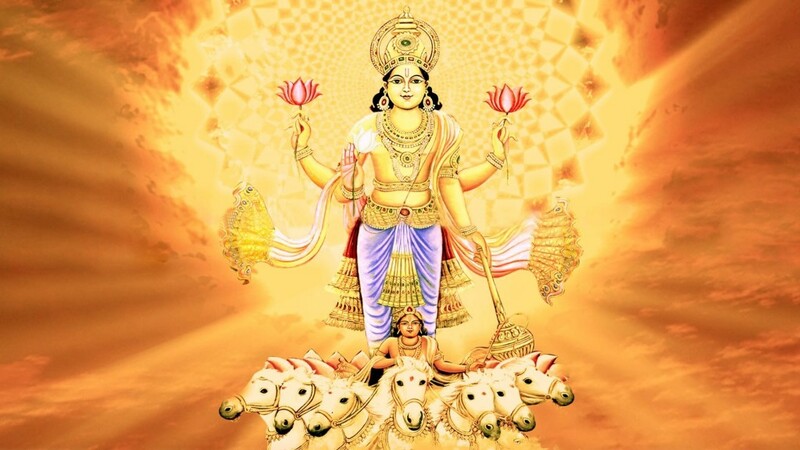 In the spiritual culture of India, Sun or Surya Dev is called as the “Pratyaksh Devta”- A visible God. The Sun is responsible for all life to survive, thrive, and be healthy. In Invoking Lord Surya at the start of the New Year we offer our prayers and commitment to Planetary Gem Therapy, Sacred Jyotish Gemstones and most importantly to our precious patrons. 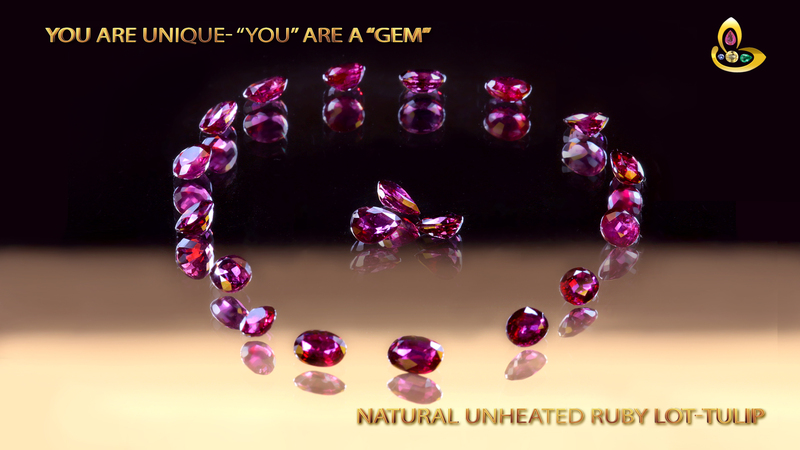 – All Natural, Unheated, Untreated Rubies. – Brilliant, resplendent Fiery Reddish Pink Colour. – Exceptional High clarity Levels of 90% and above- Rare in Natural Unheated Ruby with this pristine colour shade. – Beautifully cut as Ovals and Pears. The Cut is magnificent maximizing the movement of Light. – Superb Lustre. Set in the right design you will have a collectible that you will cherish for life. – Fully Free from any of the flaws as Listed in the sacred texts for giving life Changing Results. To appreciate the beauty and features described above we recommend you to watch HD Version of the Video (1080P) as the photograph does not do justice to these precious Rubies. We have reported you the market trends and prices of Natural Rubies for the last 5 years. These price trends can be found here. THIS lot breaks that trend and it was assembled by us in the most fortuitous circumstances. Its like- it came as a blessing from Lord Surya himself and we are passing this price advantage do our dear patrons as the Gemstoneuniverse advantage. This lot will enable people especially limited by budget to implement Gem Therapy. From all of us at Gemstoneuniverse.com, we wish you a very Happy New Year 2016. We pray and wish that this year brings you and your loved ones the gifts of happiness, smiles, solutions and achievement. Wishing you a positively momentous year ahead! It is has been an exciting, magical journey with Jyotish Gemstones, Solutions, Gracious and Courageous Patrons, Viewers and Vendors who has given us so much love for more than 15 years. The foundation stone of this journey has been the team Vision, Mission and Values that have taken 15 years to form and these cornerstone principles that let us emulate and live the Dictum of –Deo Amabiles Et Hominibus– Pleasing to God and to Men. These principles also help us deliver 100% error free Gem Therapy and enable us to be a positive contributor in our patron’s journey especially when it comes to the domain of Gem Therapy. Given the continuous increasing reach of Gemstoneuniverse, newer challenges and situations like expansion of teams and new members joining the team it is imperative that to keep ourselves centred and keep achieving the lofty goal of 100% error free Gem therapy we need revisit the Vision, Mission, Values-understand complex dynamics of new business environment and most importantly believe in what we do and do it with Love and Conviction. 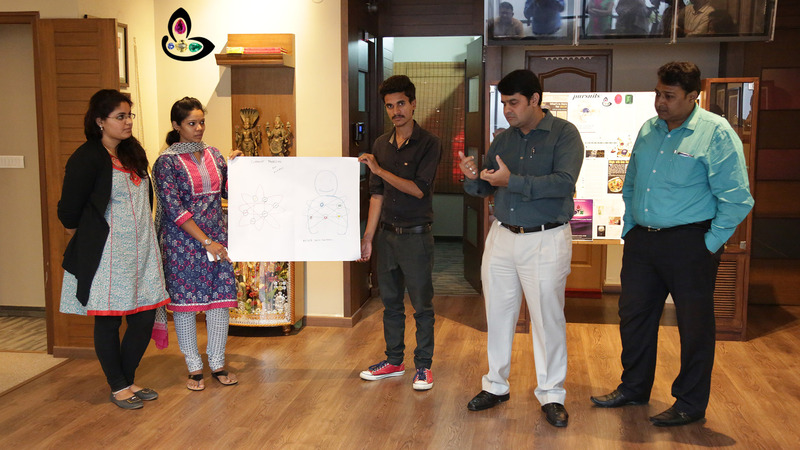 To achieve the objectives and have a clear understanding of the Gemstoneuniverse vision, a vision, mission, values and conflict workshop was conducted on 15th December 2015 at Gemstoneuniverse Bangalore. Love and Respect– Appreciating the failures and successes of each other and deep bonding. Knowing the origin of all team members. Love and respect for our clients and their unique life situations. Vision and Mission: Understanding, Assimilating the Vision and Mission that has delivered life changing Gem Therapy. Detailed Vision and Mission can be found here. 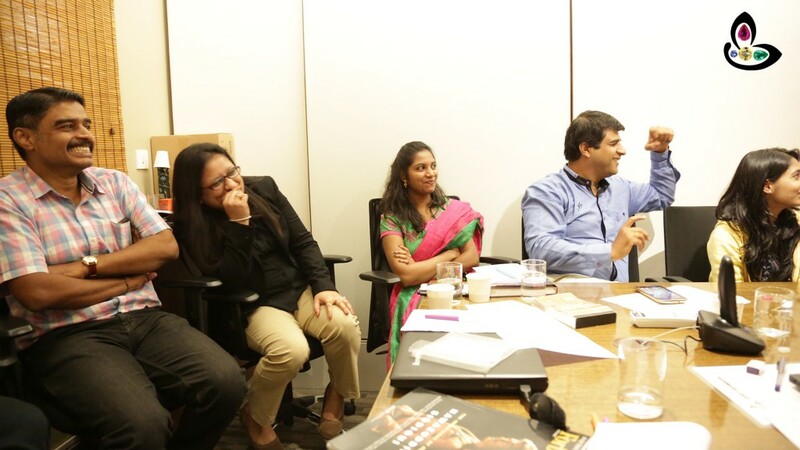 Values and Strengths: Discussion and Imbibing the Values that help us achieving the vision. Conflict: Importance of conflict, why conflict is Good, Personal Style and Approach in conflict situations. 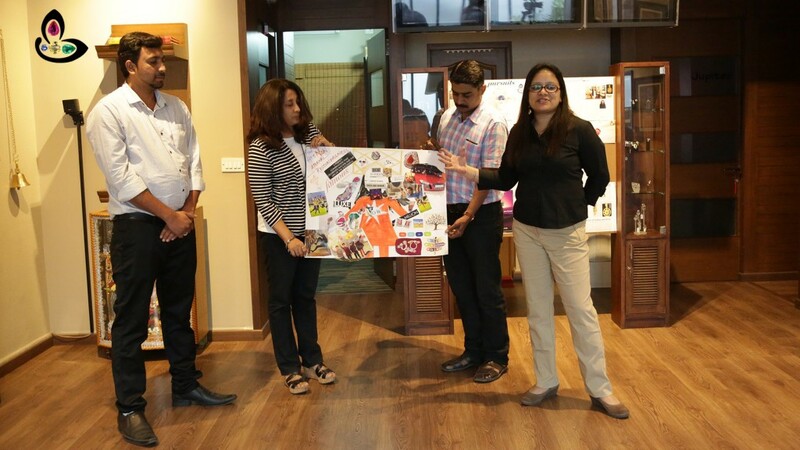 The Basic Objective of the workshop was to expand the feeling of oneness and family beyond the old guard and unify the team in helping our customers, clients and patrons in fulfilling their destiny. The program was facilitated by Aparna Ponappa an HR professional and Trainer from REDD who is a graduate from XLRI Jamshedpur. The best part of the workshop was individual interpretation and presentation of the Vision as Teams. The outcome- With every participant in every department having a 10X soaring version of the vision, we know our heart and values are in the RIGHT place. 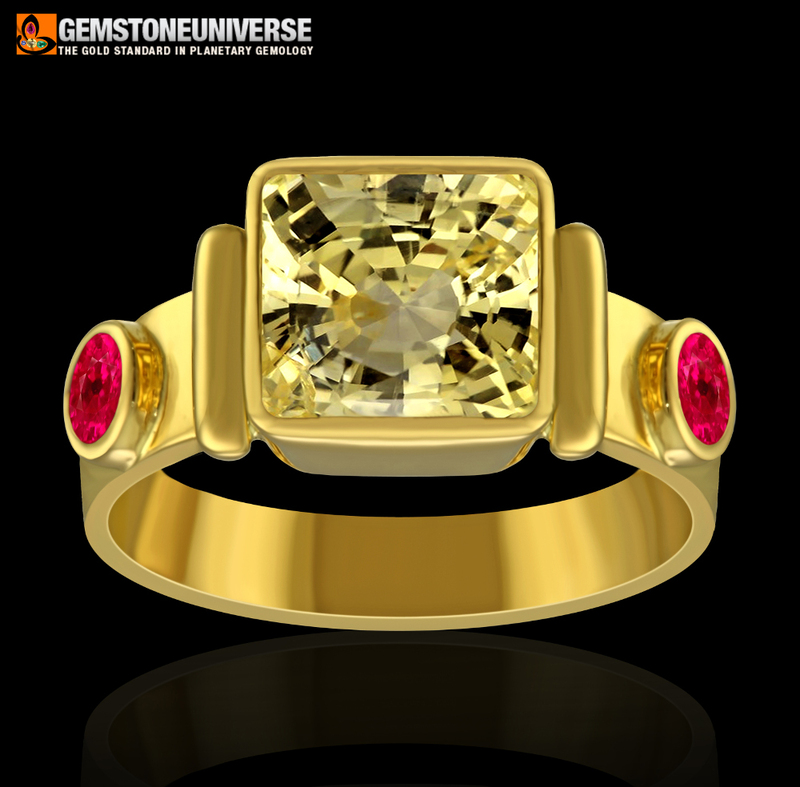 Sharing some images from the workshop for dedicated Gemstoneuniverse Fans and Patrons. A Heartening change that we see happening after all these years is how the awareness of Gem Therapy is spreading and how individuals are going the extra mile in their research and stretching themselves and fighting obstacles in making the correct choices. As explained very succinctly in Do Gems Work- No they do not for 90% of the people there is no magic pill or panacea that can miraculously cure all the problems in one shot. The Karmik Life map will play out however if you make the right choices and your expectations is correct you have a bright chances of optimizing your life and having a much higher and richer life experience index. Life is all about making several small right choices that add up to make one huge impact. Life is not about that one huge stroke of luck or lottery. It is always a better choice to depend and to bet on making several small choices rather than wishfully waiting for that one chance that will wipe the board clean of all bad choices or negatives and life will be rosy again. The story behind this talisman. The client ( patron for us) has somehow found out about Lucky Gemstones and their impact on destiny and luck through somebody and spent close to a year on research including the Gemstoneuniverse website reading information, assimilating information and using the Google translate tool before reaching the decision to order. However when he Did make a choice to order and send us a e mail We replied to him after checking the shipping policies there was no insured speed post facility delivery to a retail customer in Colombia (Packages with Valuable Gemstones and Real Precious Metals Such as Gold and Silver cannot be sent out of India without Appraisal as of 29th November 2015. Read more of that here). The Only option available was registered post and the Bangalore Post Office had no data of how many days it will take the package to reach Colombia because they hadn’t booked one to Colombia for quite sometime. We communicated the same to the Patron. What choice did the Patron Make? The Patron replied back saying… I am willing to take this risk and wait out for my package but I will get my Gemstones and my ring from Gemstoneuniverse Only. When we get a mail or communication like this it makes our day. It gives us that inner sense of satisfaction that what we do is a small but significant contribution in another individual’s journey and it is a moment of pride for us for Gemstone Therapy and Gem Recommendation is not just work or mode of profit for us. It is our passion, our mode of worship. We estimated that that package will take anywhere from 50-60 days to be delivered but the package was delivered exactly in 21 days in mint condition and our customer was not just satisfied He was delighted. You sense the delight when the very next week you get a new order from the same patron and guess what you start getting new orders from where… You guessed it right-Colombia. The power of Indian Gem Therapy is spreading to diverse cultures and countries. Individuals are using smart tools such as Translate to overcome language barriers. Individuals appreciate the hard work and openness with which we have discussed Gem Therapy for the past One and a half Decade. You have a total of 3000+ resources on Gemstoneuniverse website, blog and Video Channels. Individuals are making Smart choices such as in this case by opting for a flawless upratna rather than a bluff and treated 5.25 Ratti Yellow Sapphire/ Pukhraj that doesn’t work. India Post can deliver registered parcels to far away locations even though it might be their first time book such an item. 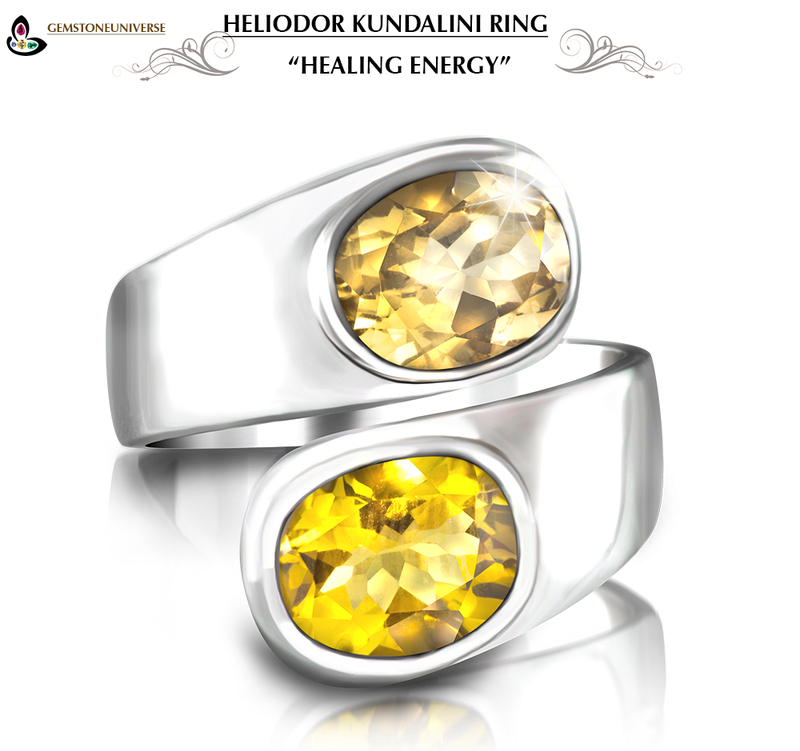 This two Gemstone Heliodor-Golden Beryl Kundalini Ring is true Bliss and if you a Gem lover you will need to view the video to watch the life in these Gemstones to appreciate what true Jyotish Gemstones really are and what they are actually blessed with that empowers them to deliver cherished results that bring solutions in the life of the individual. Bright deep Golden Colour with High Saturation and lustre akin to fire that reflects through each of the fine cut facets of these brilliantly calibrated oval Heliodors. The combination of cut, color and clarity give the appearance of a sea of molten liquid gold within the Gem crystal and this is what fine Gemstone are all about. The contrast of the rich Golden colour of the beryl with the muted silver makes the ring striking- Who said Jyotish Gemstones are boring? Heliodor is the 2nd choice of Upratna as a Yellow Sapphire alternative but with natural and untreated Yellow topaz becoming in many cases rarer and pricier than Yellow Sapphire today Golden Beryl is the most viable and the most effective alternative to Yellow Sapphire. Can anyone wear Blue Sapphire/ Neelam without consultation? Can anyone wear any Gemstone just based on Benefits without consultation? Can anybody wear a Neelam-Blue Sapphire? The root of this question comes from a desire for extra ordinary and exceptional results and a need for a fast turn around in life situations based on some random material on the internet that claims that the Blue Sapphire has the power to turn a pauper into a prince and similar such statements. Perhaps the Gemstone surrounded by the maximum myths in the world of planetary gemstones and planetary gem therapy is the Blue Sapphire also called as Neelam in Hindi. The Blue Gemstone of the corundum family is the Blue Sapphire and as per Vedic Astrology it is the Gemstone of Saturn. Saturn also known as Shani is the planet of Karmik retribution is responsible for pain or pleasure in its periods as per Karma’s/ actions done in the previous life. Saturn periods are in general difficult planetary periods. – The Blue Sapphire is a very powerful Gemstone. – The Blue Sapphire is a fast acting Gemstone. 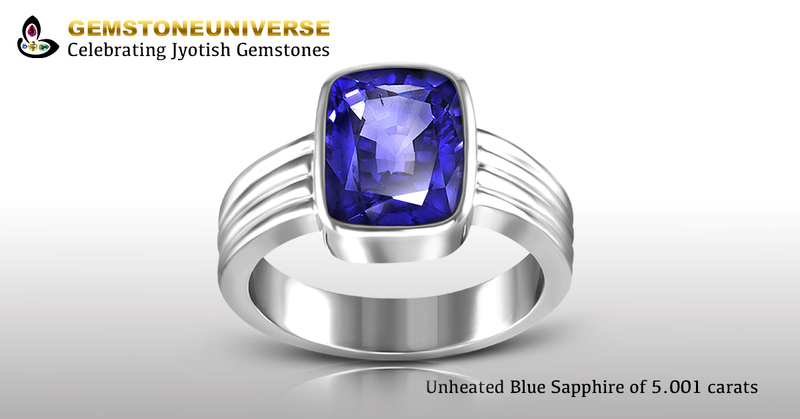 – The Blue Sapphire gives financial gains and removes dullness and lethargy from life. – One has to choose the Blue Sapphire very carefully with the help of an expert and absolutely avoid the Blue Sapphire flaws. If you are not sure of your source of the Blue Sapphire or his/her expertise it makes sense to test the Blue Sapphire as a Blue Sapphire with flaws can lead to many problems including accidents, health problems etc. If you understand the import of the above discussion then just by reading Blue Sapphire benefits at any random place do not wear Blue Sapphire. You may feel tempted to have fast positive change in life but it might be a decision that may prove fatal. Hence anyone/everybody should not wear Blue Sapphire without a detailed horoscope analysis by an expert Astro Gemologist. In fact none of the Navagrah Gemstones-The Gemstones of the Nine Planets also called as horoscope gemstones should be worn randomly without a thorough analysis of the horoscope by an expert Astro Gemologist. It is better not to wear any Gemstone just based on a random benefit statement and get into problems. Always wear a Gemstone only after consultation. There are certain things that cannot be explained in words and can only be experienced, the beauty of the Blue Sapphire featured today is one such thing. 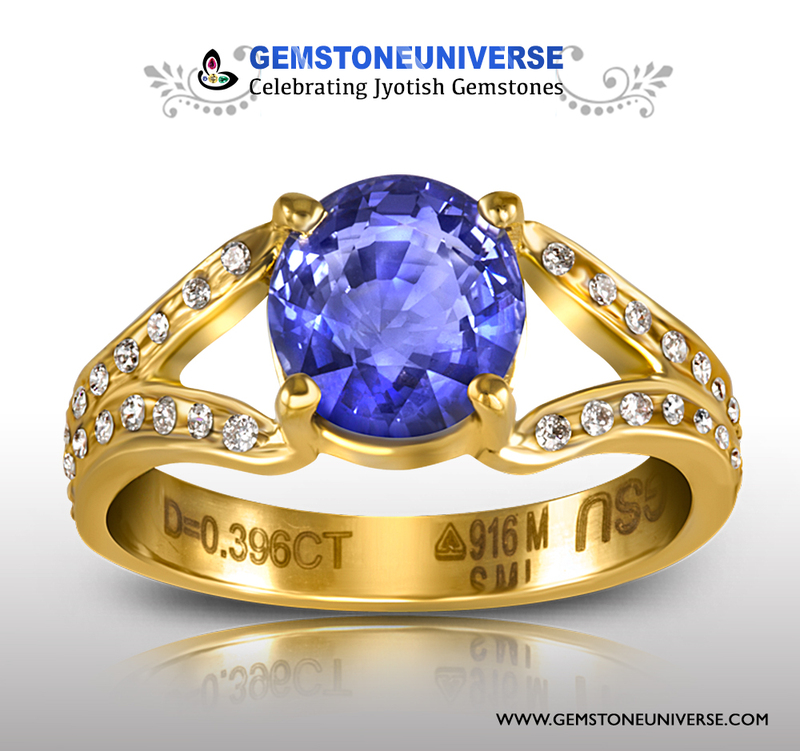 This is the ultimate example of a True gorgeous and powerful Jyotish Gemstone Blue Sapphire. The colour is a deep rich royal Blue which is the most desirable and coveted colours in Blue Sapphires. The Colour has a pure tone and hue and is evenly distributed throughout the crystal and not concentrated in just one area. The exceptional clarity ensures the maximum movement of light and the play of lustre and this is the glorious inward glowing lustre the sacred texts speak about. 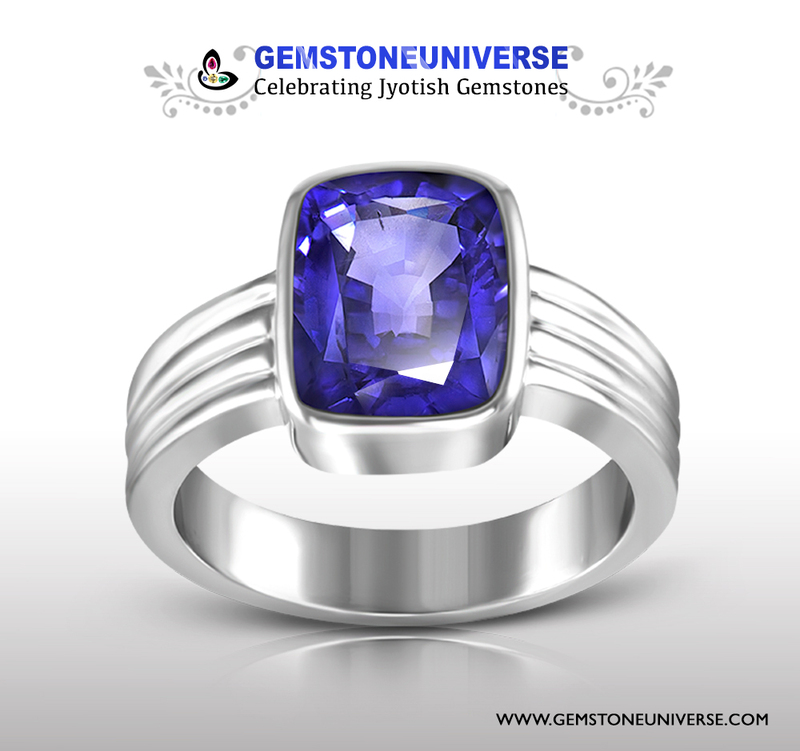 Beautifully crafted into a cushion cut this unheated and untreated Blue Sapphire all of 5+ carats is a powerhouse of positive energy that shall deliver the promised results only Jyotish Gemstones are capable of. Can emerald be worn as a pendant astrologically? The light of God is universal, healing and equally available to all rich or poor and so are Jyotish Gemstones- Question is Are you Ready? Q. Hi, as suggested by one of your comments, a jyotish gem of 5 carats starts from 6.6 lakhs, which is a huge sum and almost my annual income. Does this mean, light of God do not fall on the poor? Should I wear Gemstone as ring, pendant or bracelet for maximum effectiveness? At Gemstoneuniverse, we get this query a lot times worded in different ways and asked by different people almost on a weekly basis by e mails, disqus comments and on our Facebook page. 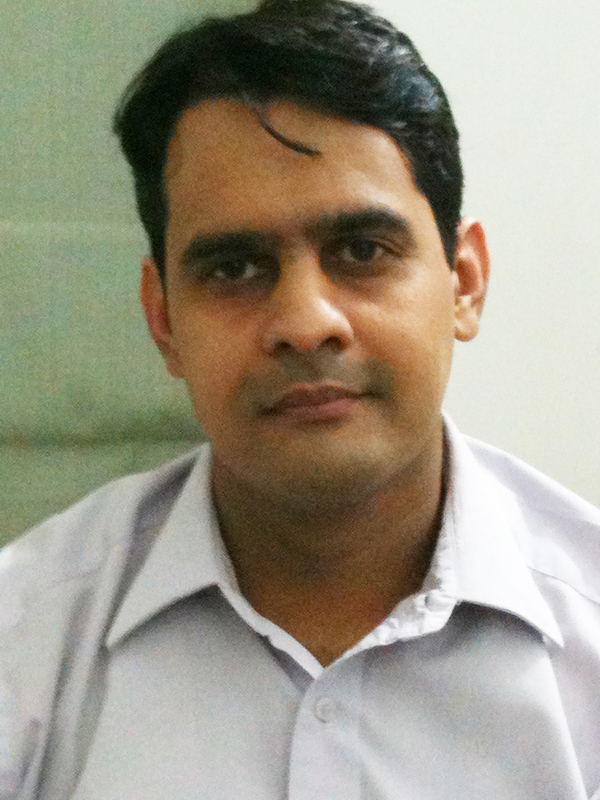 A lot of doctors for example who are interested in Planetary Gem therapy many times ask can they wear the gemstone as a pendant as for doing procedures or for examining patients many times they have to remove the rings and they have read that the gemstone contact should never leave the body for maximum effectiveness etc? Similarly people doing hard manual labour such as carpenters, electricians and plumbers-Yes, we have them as clients too, are concerned that the Gemstone may get damaged while working. For them it is in many cases a once in a lifetime investment and they are very understandably concerned to keep it safe. Then there are also cases of desperate individuals looking quickly to find back their lost lover, or those dabbling in share markets looking to recover losses quickly and similar cases who connect with quacks masquerading as energy healers, vastu shastri’s, antenna toters, pendulum dowsers, chakra scanners and what not who exploit that state of desperation and cause deliberately cause confusion by stating either the gem is incorrect, the gemstone has acquired negative energy or it is being worn in the incorrect finger or it should be transferred to the neck to get the desired objective. This is conveyed in the most mystical manner for the impact. 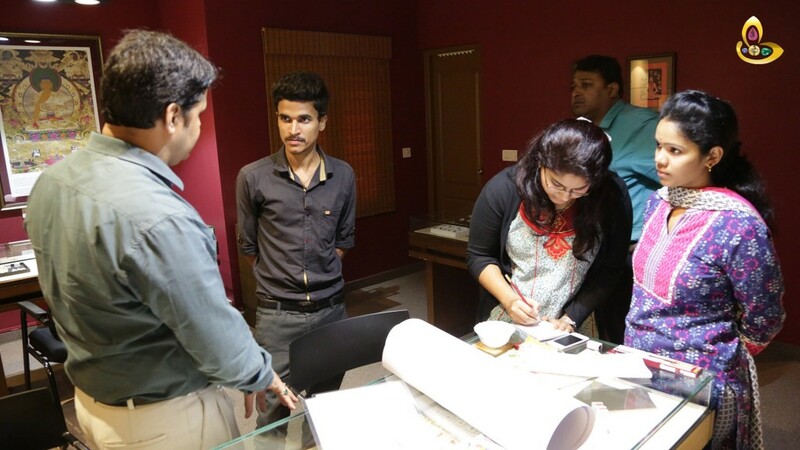 Here the clients as well as the so called consultant both are unaware of Gemstones and Gem Therapy and leads to Gem Therapy Failures due to a negative Karmik Life Map. The client’s mind is clouded by the desperate need to achieve and objective- such as bringing back lost love and the so called consultant’s mind is clouded basically by commercial motives. Individuals who find themselves in this situation would benefit from read Right expectations from Gem Therapy. There are many such cases and permutations and combinations which are beyond the scope of this article so we shall get straight to the point to what results and statistics available to Gemstoneuniverse since last 20 years say about Should a Gemstone be worn as a ring, pendant or a bracelet for maximum effectiveness?. 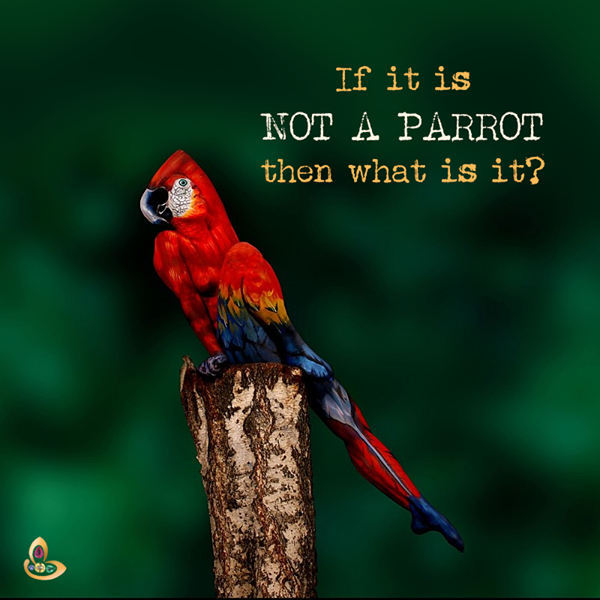 This is THE definitive resource for answer to this question as taught and practiced by the master-Guruji Shrii Arnav himself. Those who consult us by using the Vedic Gem Recommendation and stating their special needs , our team of Astro Gemologists at the time of making their Vedic Gemstone prescription do a thorough analysis and make the best recommendation. Gemstones work primarily by reflection and absorption of light and by touch. In Gem therapy one of our primary goals is maximum movement of light and that is why we advise use of only Jyotish Gemstones with the highest possibility of clarity and purity of colour. Each planet has been assigned a specific position on the human palm. These are known as mounts and they are placed below specific fingers and they have been discussed in detail here. The entire body is connected by nerve cells or neurons. Your fingers are highly sensitive to any signal and convey that sensation to the brain almost instantaneously. Imagine holding a glass of hot water. How fast the signal gets conveyed. Hence the best option to wear Gemstones is as a finger ring as the planet is receiving the energy of light and conveying it and transmitting that energy to a specific part of the brain. That is the precise reason, that for academic excellence and for communication skills it is advised the Emerald Gemstone which represents the power of Planet Mercury should be worn in the little finger as the mount of mercury is located just below the little finger. Best results have been observed using this approach as there is no obstacle in light movement. In fact the movement of light is maximized. Unless and until there are special needs such as restraints caused by employment requirements or religious belief etc it is always best to wear Gemstones as finger rings to harness the cosmic energies of the planets. 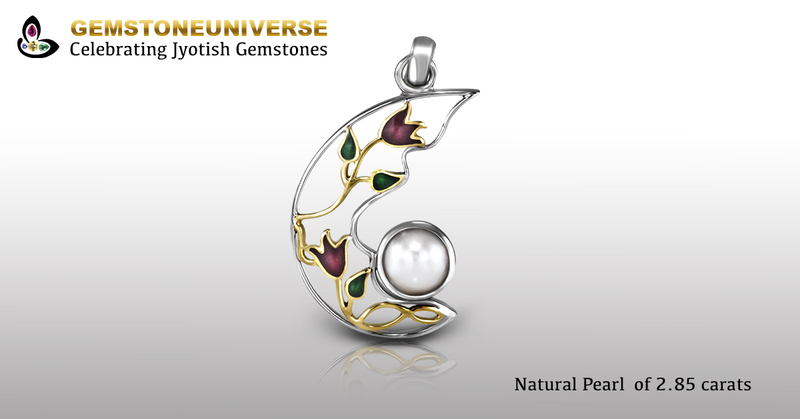 The second best option of wearing gemstones is as a pendant. Here also light reflection and absorption is occurring but not to the extent when worn as ring. This is especially useful for people of certain professions such as Doctors, Army men, individuals involved in tough manual labour or work in which gemstone is likely to get damaged or for those who are constrained because of social, employment or religious causes. However before wearing the gemstone as a pendant an expert Astro Gemologist should make a detailed assessment of the horoscope and check whether this will be beneficial to the client or not?. 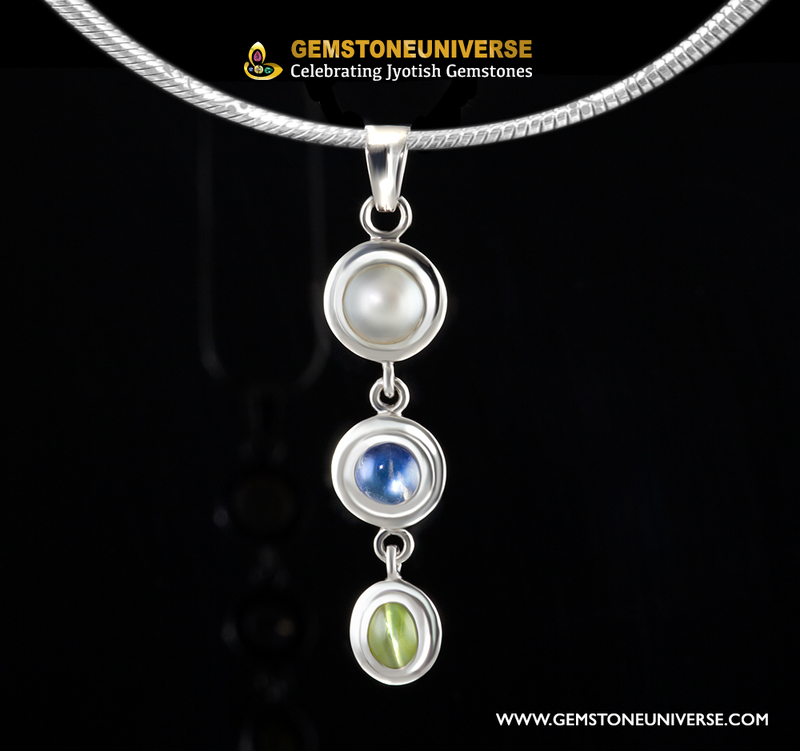 Amongst many other factors one of the important points when wearing a Gemstone in the neck as pendant is akin to establishing the planet in the ascendant which may or may not be a good thing hence a detailed chart analysis is a must. The ascendant lord Gemstone can always be worn in the neck as pendant touching the thymus gland area. Wearing Gemstone in the neck as pendant is also good in cases of healing of diseases, health ailments, boosting immunity etc. If you are wearing a Gemstone for good luck or for achievement of a specific objective as per the laws of Planetary Gem Therapy then you have to wear the Gemstone for 24 hours/ 365 days in a year. Wearing the Gemstone as a bracelet is the least effective method primarily because it is plainly cumbersome with the bracelet moving all the time especially if you are wearing a combination of gemstones in a single bracelet. Secondly if you have to wear it all the time then it should not be shifty and should be durable and statistically we have seen maximum problems in the bracelet mode. It is just not made for heavy duty use and because the bracelet keeps on moving there is also chance of the Gemstone surface getting scratches, gemstone popping out from setting, precious metal getting scratched from contact with normal surfaces like the working table or the laptop, or the gemstone getting damaged. A minority of clients who opted for bracelets by choice mostly got them changed eventually. As far as Astrological impact is concerned there seems to be lack of data. You can use bracelets for fashion and off and on use but practically these are not really an option for heavy duty astrological use for planetary gem therapy. Hesitation in wearing Gemstones as Finger rings? On a closing note I would also like to address that some of you want to wear Gemstones as pendants and cite that you would not like to disclose or let people know that you are doing this therapy or believe in gemstones. I am fine with your explanation and accept it but would like to add my humble opinion and learning. If you have a mindset of shame or embarrassment while using these divine instruments of change formed over a million of years for welfare of mankind then it would be worthwhile to read Do Gemstones Work- No They Don’t for 90% of the people and defer wearing gemstones till that time where you establish the trust and faith with these divine friends that are gifts of God. It will be quite a rare occurrence if you would find a wide variety of precious gemstones for sale online with listed prices as many Vendors understand the three attributes that makes a gemstone into a precious gemstone- A gemstone should be precious, rare and durable to be called as a Gemstone. Some insiders of the Gemstone industry along with certain software companies have developed software that tries to predict a price of a gemstone for sale based on cut, colour, and clarity and carat weight but till date (10th September 2015) there is not a single software that can accurately predict a gemstone selling price. Some historical gemstone pricing indexes are also way of the mark and mostly give inflated number for Gemstone Sale price. To assess Gemstone colour with accuracy itself is a different task and to assess the three parameters of hue, tone and Saturation itself takes around a decade for a hard working and intelligent Gemologist. At Gemstoneuniverse we cut out the guess work and bring the best of our expertise to the table with a choice of fine gemstones for sale that work invariably in every geographical part of the world. So whether you are in Singapore, Japan, USA or Europe it is quite likely that you will find you” The One” Gemstone here. Gemstoneuniverse has many varieties of Natural, Certified Gemstones for Sale including the big 3-Ruby, Sapphire & emerald from the best mines in the world. Our local presence in the major mining areas of Mozambique, Madagascar, Colombia, Zambia and Ceylon ensure that you are closest to the source and you are getting an unmatched price. When Looking for fine Loose Gemstones for Sale such as a Basra pearl or an Exceptional Colombian Emerald your quest ends here. Gemologists Notes for the Ring Featured Today. You will need to view the video to assess the exceptional clarity of this beautiful Ceylon Sapphire of 3.74 carats because words are inadequate to describe this rarity of clarity. The Gemstone has an Oval Mixed Step cut that grabs the light and make it swirl and dance through it well shaped facets adding to the drama of the lustre. The ring design also has drama as the shank looks like the open mouth of the cobra holding the Beautiful Blue Sapphire. 36 round brilliant diamonds on the band make it stylish, elegant and inviting. Look at the all inclusive price for the end patron. That is possible just because of the Gemstoneuniverse Unmatched Price Guarantee. Can Hessonite be worn as a pendant astrologically? As per Vedic Astrology every planet has been given a position on the human palm and fingers. The Shastras-Sacred texts also suggest the best position for the gemstone to be worn for optimum effects. Hessonite is the Gemstone of Rahu-The north node as per Vedic Astrology and the middle finger of the working hand is the best place to wear this powerful gemstone. If used for healing especially in cases of Cancer and mental disorders in some cases it is also worn in the little finger after consultation with an expert Astro Gemologist. 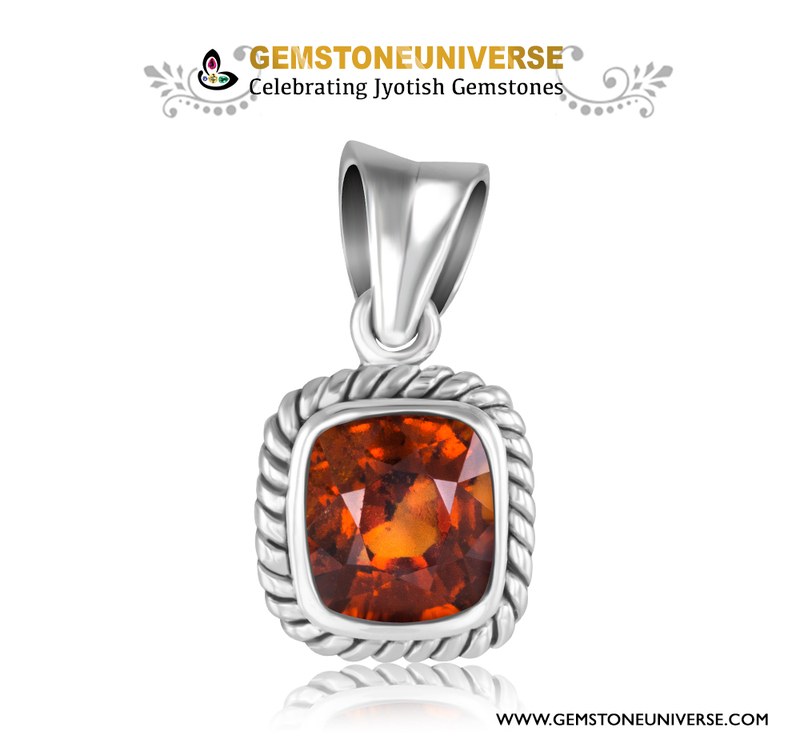 Here we will discuss Astrological conditions in which Hessonite can be worn as pendant and gives good results. Wearing a Gemstone in the neck as pendant is akin to establishing the gemstone in the 1st house which is also called as Lagna or Ascendant. The ascendant lord is one of the major influencing and powerful planets in the birth chart and acts like a protective shield especially in matters of health, immunity, prevention of diseases and accidents and recovery from a disease or a health problem. Here we will discuss the major factors but not limited to, the conditions in which Hessonite worn in the neck as pendant gives good results. Rahu posited in the ascendant/ first house. Rahu posited along with the ascendant lord. Rahu aspected by the ascendant lord. The Ascendant Lord Aspected by Rahu. 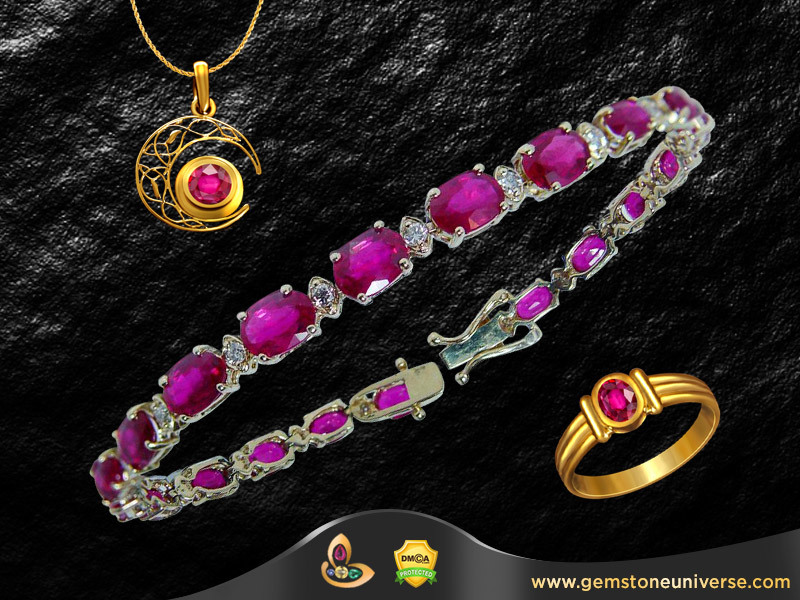 The above are some of the conditions in which Rahu Gemstone-Gomedh when worn in neck as pendant gives good results. One needs careful astrological examination of the birth cart before wearing the Hessonite in the neck as pendant because the Hessonite is a very powerful gemstone and also in cases such as Rahu posited in Sagittarius or Pisces-The signs ruled by Jupiter. The Gemstone should ideally touch the thymus gland area (just behind the sternum and above the first rib bone) for the best results. To achieve this position in general a chain length of 22inches-24 inches is ideal. 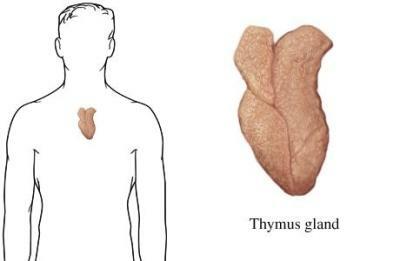 However individuals who are too tall or short may need to get a custom length as per their height so that the gemstone touches the thymus gland area. Featured today is a fine Natural hessonite garnet from Ceylon-Sri Lanka. Having the coveted and the brilliant Deep Burnt Orangish Cinnamon Colour the colour is brilliant, vivid and saturated to that extent that it appears that embers of fire are leaping from its belly. Exceptional, scintillating lustre and high clarity add to the draw of the gemstone. All of 4+ carats all natural, earth mined and free from any enhancing treatment this cushion shaped Hessonite is a true Jyotish Gemstone that shall deliver the best results only Jyotish Gemstones are capable of. Gemstones have three essential attributes- They are beautiful, they are rare and they are durable. Gemstones chosen as per the horoscope after detailed analysis by Vedic Astrology are called as Horoscope Gemstones. Vedic Astrology is very detailed and has been used since times immemorial to illumine the path of the individual. It gives great insights in all aspects of life and is basically the chart of the journey from the womb to the tomb. As per Vedic Astrology each aspect of our life is governed by the 9 planets also referred to as the Navagraha. These planets have been assigned rulership of various houses in the horoscope and also have a governing gemstone. Recommendation of these Gemstones after house and horoscope analysis gives good results to the individual, helps in boosting fame and fortune, removes obstacles in life and in general bestow health, wealth and solutions to life pressing issues. 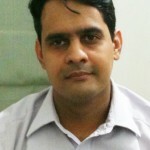 One should ensure that they are wearing Gemstones as per the Graha Anukul Philosophy that states that only planets that rule auspicious houses in the horoscope should be boosted by wearing their horoscope gemstones and the negative planets should be pacified by giving donations related to the planets causing negativity. This two pronged approach gives one the full cover and generally gives positive results that are measurable. One should not wear Horoscope Gemstones just based on Sun Signs or Moon Signs. Real Jyotish Gemstone has very powerful and profound impact on the body and the mind and should only be worn after a thorough analysis by a competent Astro Gemologist. Featured today is an exotic full natural pearl from Northwest Australia. Less than 2% of all pearls in the world are natural and for astrology purposes only Natural Pearls of the most flawless quality should be used. Certified by X Ray Radiography and X Ray Diffraction this beautiful perfectly round pearl has a white body surface with just of Gold. Top Quality blemish free surface that is smooth, free from any marks and is pristine white. 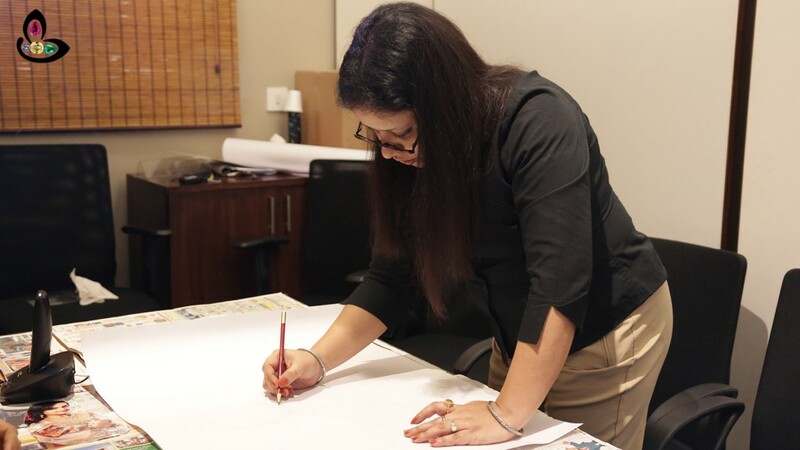 The beauty of the pearl is accented by the design the client has chosen. The design element takes into the account of the moon shape, bow shape and the pearl itself seems to be set at the mid point of two semi circles representing the OM. Addition of colour using enamel adds to the contrast of the white of the peal and the flower, stem and leaves of Gold represent the essence of life.. Always alive, always perpetuating and never ending. A supreme example of a true Jyotish Gemstone and talisman that shall deliver the best results only Jyotish Gemstones are capable of. As per the sacred texts of Vedic Astrology the moon is the ruler of the mind. Chandrama Manso Jaatha or moon is the significator of the mind is well known tenet as per many Vedic Astrology texts. A strong moon represents a strong personality, good decision making, stable temperament and the ability to cope with life events especially the more challenging ones with equanimity. A weak moon on the other hand can manifest in fear, mood swings, depression, anxiety etc. In fact many of the afflictions of the mind are connected with the planetary position of the Moon in the Vedic Horoscope. An expert Vedic Astrologer can thoroughly analyse these challenging positions and recommend rewarding and fruitful gemstone therapy to resolve these issues to a large extent. The nodes also known as Rahu and Ketu are basically” Karmik” in nature and represent strife, disappointment and challenges in the birth chart. In rare cases these are also associated with awakening of the Kundalini and self realization but in most cases it is a painful process in most cases. Association of nodes with the moon represents a Karmic Challenge that one must actively seek to resolve and attend to. In cases it becomes the case of deeply afflicted planetary positions and an active intervention is required to resolve these stressful situations and attain a better quality of life. Vedic Astrology and Jyotish Gemstones hold the promise of setting the correct course and bringing in considerable relief if an accurate diagnosis is made and the therapy is implemented using true Jyotish Quality Gemstones. Comments Gemologist’s Notes for the Triratna Pendant featured today:Featured today is a classical three gemstone pendant set in silver to fortify the energies of moon and Ketu in the birth chart.The first Gemstone to be used is an extremely rare Natural Pearl with a radiography report and an X Ray diffraction certificate. Less than 2% of all pearls in the world are natural and to get this quality is extremely rare and a matter of good fortune. The pearl is pure silvery spotless white, of a round shape, blemish free surface with high mirror polish. All the essential parameters of a true Jyotish Gemstone. The Patron has opted to boost the power of the moon further by adding a Natural Sri Lankan Blue Moonstone of high quality that exhibits the phenomena of Adularasence in a clear manner. 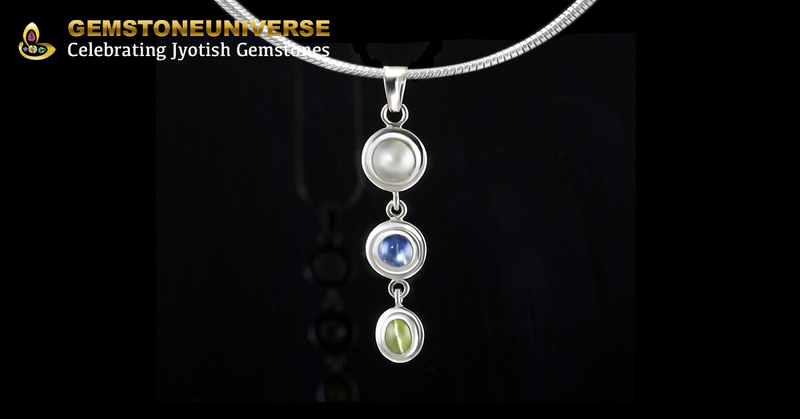 Blue Moonstone is the Upratna/ Superior Alternative Gemstone to Natural Pearl. The third Gemstone is a Green Cat’s Eye Chrysoberyl of 1.78 carats with a brilliant, majestic and a top chatoyant band and is exhibiting pronounced Chatoyancy. All in all a very powerful Talisman that shall deliver the best results that only Jyotish Gemstones are capable of.